While maintaining the four-hundred-year-old traditions of Mikawachi　ware, we strive constantly to keep our craftsmanship new and fresh. To us, this means expressing our own individuality through porcelain items modelled on traditional forms and patterns. Finding ample scope for self-expression in traditional tooled-chrysanthemum appliqu? work (kikka-kazari zaiku) and other ornamental ware, as in our everyday tableware and all our other products, we pour our creativity into our work. 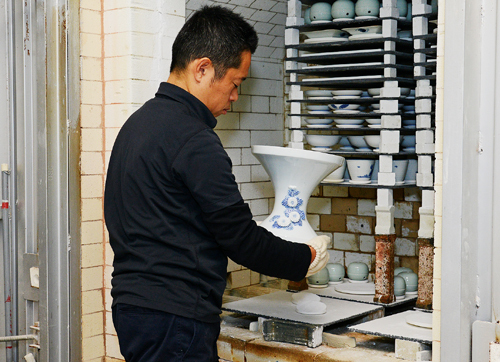 Through our dedication to the creative craftsmanship known in Japanese as monozukuri, we hope to be worthy of the continuing support of our customers, and to approach, in some small way, the great achievements of our kiln's pioneering artisans. We created our showroom by redecorating the rooms which, until the 1950s, housed the living quarters and workshop of Morisabur? Nakazato, the 16th generation kiln head. The pillars in the showroom are original features; from what we have been told by members of previous generations, they are at least a century old. The living quarters, in the central part of the building, are the oldest part, dating back at least as far as the 18th century. Although the building's exterior has changed with the times, we keep photographs in our living quarters showing how it used to look. Our studio was once the site of a wood-fired single-chamber updraught kiln or a coal-fired kiln. That is why the floor slopes a bit; the ground level was raised before the studio was built. Our building has been used continuously for generations, and we intend to cherish it for a long time to come. In the showroom, the products of our kiln are on display, grouped by series. We hope you will drop by and take a look some time. Our studio stands on the site that, up until 1955, housed a coal-fired kiln ( originally a wood-fired kiln). When our studio was first built on this site, the old kiln was replaced by a new gas kiln, and over subsequent years, the studio building itself underwent several remodels before attaining its current form. It now consists of sections made respectively of reinforced concrete and wood. Inside, the floor has been scooped out and levelled, making it easier to move around, even when carrying heavy objects. The studio consists mainly of three areas: the kiln area, the workshop (including workstations for glazing, plaster-mould work, and painting designs), and the carving area. 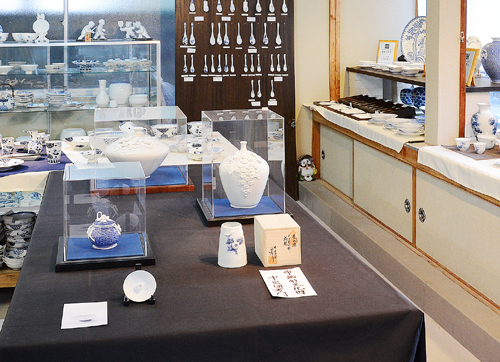 Born in Gyokutõ, Tamana, Kumamoto Prefecture, Yumiko Nakazato graduated from Tamana Girls' High School, married Ichirõ Nakazato, and began working at the kiln as a porcelain painter. 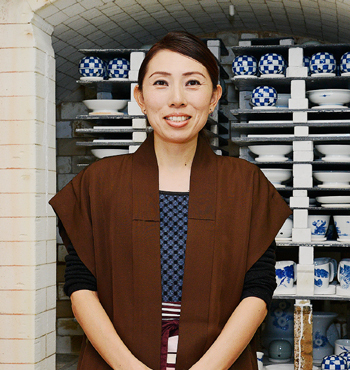 Besides having won the Grand Prix at the Mikawachi Ceramics Exhibition, the Sasebo Mayor's Award at the Mikawachi Ceramics Exhibition, and the Sasebo Mayor's Award at the Nagasaki Ceramics Competition, she is a METI-certified Traditionally-Skilled Mikawachi-Ware Artisan. 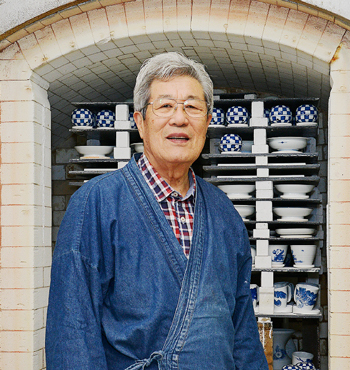 "My main job is painting designs on unglazed ware: Until I married the 17th generation kiln head, I had no experience of this profession, but now, every day without fail, I take up my brush and give my undivided attention to my task. Taking full advantage of my feminine sensibility, I try to give my designs a feeling of serenity, and I like to think this comes through in my work." Born in Mikawachi, Sasebo, Nagasaki Prefecture, Taiyõ Nakazato graduated from the Ceramics Department of Saga Prefectural Arita Technical High School, and later from the Department of Social Welfare at Kyõei Gakuen Junior College Junior College (as a Certified Social Worker). He then pursued language studies in the USA, and trained in ceramics in the Netherlands. 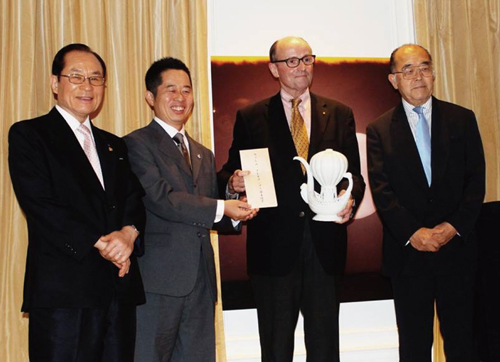 Now the 18th generation head of Hirado Kohsyo Danemon Kiln, he has won the Grand Prix at the Mikawachi Ceramics Exhibition, and the Traditional Industries Encouragement Award at the Nagasaki Ceramics Competition. "As well as the casting, painting, glazing and firing processes, my main work is throwing and carving. At our kiln, we have a system whereby my father and I form the pots and my mother and my wife paint the designs on them. I intend to stay in Mikawachi, working hard at my craft, with a primary focus on white porcelain ware (hakuji) and underglaze blue (sometsuke)." Born in Shibata, Niigata Prefecture, Yumiko Nakazato graduated from the Department of Architecture at Shibataminami Senior High School, and later from the Housing Studies Department at Kyõei Gakuen Junior College. Having worked at an architectural firm in Niigata Prefecture (as a Certified Class 2 Architect), she married Taiy? 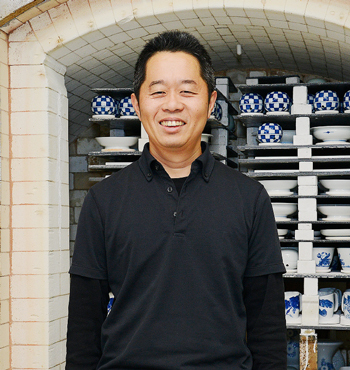 Nakazato and began working at the kiln as a porcelain painter. "I try to paint as delicately as possible. My jobs include painting a motif we call yûyû karako ("Chinese children at play"), which is one of our traditional designs featuring karako (Chinese children in medieval costume). Getting their facial expressions just right is really tricky. 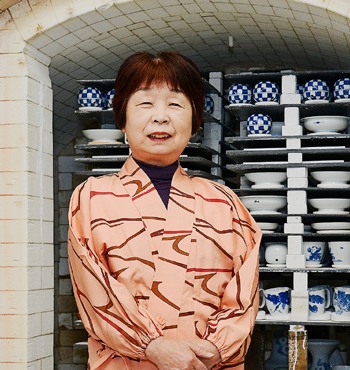 My mother-in-law is in charge of most of the painted designs at Hirado Kohsyo Danemon Kiln, and I intend to follow her example by working as hard as I can." In addition to the family members listed above, the kiln also employs another artisan who carries out the highly-skilled work known as dami (filling in the outlines of the designs painted on unglazed ware). Copyright © 2018 HIRADO KOUSYOU DANEMON KILN Co.,Ltd. All Rights Reserved.